As a scout, your job is to rush ahead of your team and spot enemies that are still moving into a position. Good scouting can provide your sniper teammates with some nice shooting opportunities early on. One important thing to remember as a scout is that you have a longer spotting range than other classes, so you can sometimes spot enemies without them spotting you. This can be really annoying for a player on the other team that is being spotted, and will often cause him to abandon his position and pull back. Another advantage of a scout is his great speed, so use it to your advantage. Flank your enemies as much as possible, but pay attention to a minimap so you don't get too far ahead of your teammates. One thing to avoid as a scout are prolonged shootouts because his SMG doesn't have as much accuracy as we would like, and I was really disappointed at the accuracy from a crouched position of this weapon. Anything beyond 25-30m will be difficult to hit from anything but prone position. Also, 95 HP makes a scout somewhat fragile class, so the best way to use him is to bravely shoot enemies in the back… As a scout, you will also have one more enemy: ledges. It looks like that the faster your character moves, the more damage he will take when sliding down the ledge. Well, because of this scout can easily take more than 20 points of damage if he slides down one of these ledges at full speed, so watch your step. Hand grenade – As a scout, you get very cool ability that is great vs enemies that are camping behind cover. Your hand grenade will deal 45 points of damage, it has large blast radius, 25 seconds cooldown and can be used twice per battle. I find this ability very useful when dealing with enemies behind sandbags or rifleman barrier since you can lob grenades inside their cover. The only downside of this skill is that it can be somewhat hard to judge the distance of your throw. It is also important to note that once thrown the grenade will detonate on impact (instead of after 3-5 seconds that is more common in FPS games). This is probably the best of the three abilities or at least the most fun to use, so blast your enemies and show those campers who’s the boss! At close range SMG will deal between 30 and 34 points of damage, while at a range of less than 5m this weapon will almost always deal it's maximum of 34 points of damage, eliminating the enemy before he can react. This makes it great for close range combat since most enemies will die in 3-4 shots. Getting into a close range is another matter that will require patience and utilization of scout's great movement speed. Paying attention to the minimap is important for any class, but even more so for scout, since you should be the one flanking, but make one mistake and hunter will become the prey. Basically, you can't afford to make a wrong move with a scout (if you get ambushed while flanking and in the open, those 95 HP will disappear really fast). Similarly to a rifleman, scout also has an automatic fire ability when you aim at enemies within 15m, but unlike rifleman, he will fire a 3 round burst. At the medium range, this weapon will deal between 18 and 25 points of damage, which is ok. I have kind of a love-hate relationship with it, and only because of its inconsistency in accuracy from anything but prone position. However, when it does hit that low recoil makes it ideal for quick follow up shots. In a medium range combat, my advice would be to take 2-3 shots, if some of those hit, continue firing if all miss and an enemy turns to face you, get back in cover and look for another opportunity. This class really isn't suitable for long-range combat. SMG will deal approximately 12-16 points of damage, with a minimum of 9 points damage at the extreme ranges. Low accuracy and huge damage drop off make this weapon unsuitable for long range combat. More often than not avoid firing at long range because you won’t accomplish much besides giving away your position. Avoid any shootouts because you will be at a major disadvantage. Rifleman is a hard counter for scout, and you should not engage him in a head-on battle. Simply put rifleman has more HP, better gun at the medium and long range and because of this, he will win in any “fair” fight. So don't fight fair, try to flank and approach as close as possible. At point blank range you will be able to take him out very quickly, so he won't have time to react. Go prone and ambush any charging rifleman that think you're a pushover. If he is distracted, move in and attack, but get behind cover as soon as he turns to face you. Also, just spotting rifleman, while keeping outside of his spotting range, is a great idea and your team will appreciate it. 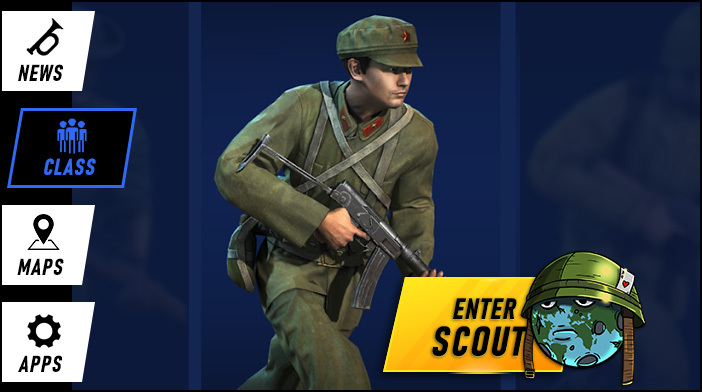 Scout is a sniper's mortal enemy, and he should be your target of choice. The reasoning for this is very simple. With your superior speed you can close the distance and get behind him, and once you're there he's toast. He can't run away, and probably won't even have enough time to turn around and face you. If there are 3 or more snipers on the map, consider pushing one side (far left or far right) all the way to enemy spawn, and there is a good chance that you’ll catch them off guard. This is a very risky maneuver but can be very rewarding if you manage to pull it off. One more note, if the enemy riflemen chose to stay back with snipers, consider taking him/them out first because they represent a higher threat for your character. Also, if you have to push forward it will be difficult for snipers to hit you because moving target is harder to hit and the scout is very fast. Always pay attention to a scope reflection of the sniper since every shot will be devastating to your character, but it will take them at least 2-3 seconds to aim, so it is a risk-reward situation. Best advice - try not to get caught off guard. The duel between two scouts that run into each other at close range will be a very short one, because of a high rate of fire and low recoil of the SMG. If an enemy scout is pushing one side and is approaching your sniper teammates consider pulling back to cover them.